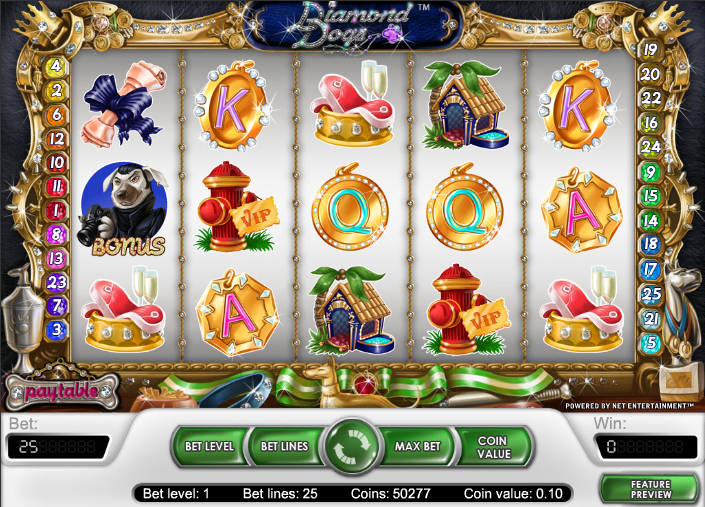 Some online slot machines seem to appear slightly out of left field and Diamond Dogs from Net Entertainment is one such game; a number of genres are included within it’s reels such as animals, celebrities and a luxury lifestyle and they’re all mashed up in an entertaining way. Diamond Dogs sparkles from every corner and the five reels and twenty five paylines are set inside a diamond-encrusted gold frame. Everything twinkles with the glow of precious stones including the basic playing card symbols but the main symbols are the entertaining ones; there’s a bone wrapped in a ribbon, a steak in a diamond-studded dog bowl, a VIP fire hydrant and a luxury kennel. The three bonus symbols are all beautifully-drawn dogs – one’s the bonus, one’s the scatter and the fierce mutt is the wild symbol. These characters are part of a group of celebrity hounds called the Diamond Dogs and you’ll get to see them all if you trigger the bonus game. We’ll start with the bonus game mentioned above and to trigger it you’ll need to land three of the bonus symbols on an active payline from left to right. You’ll now be taken to a doggy red carpet featuring twelve poshed-up animal and your task is to photograph them, revealing prize amounts until you turn up a muddy paw print. The second bonus feature is the free spins round and it’s activated by landing three of the poodle scatter symbols anywhere on the reels. You’ll receive ten free spins plus the combo prize and each win earned during this round will be tripled. More free spins are available while playing this feature. The free spins can be won by playing the minimum number of paylines but if you’d like to have a go at the celebrity feature, it’s best to play the maximum lines to make sure you land those bonus symbols. 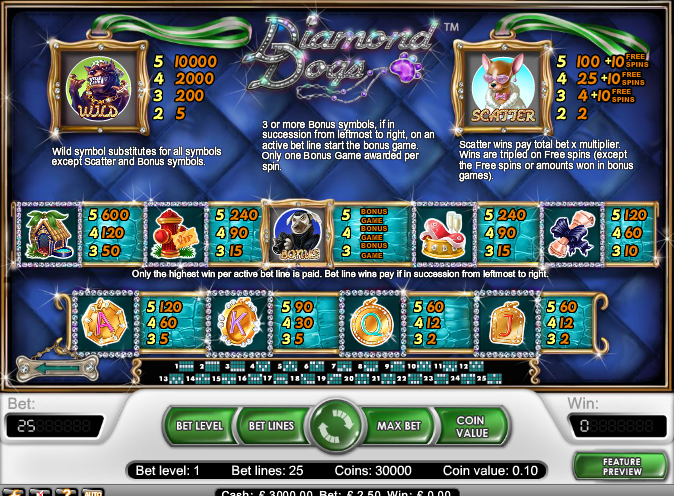 All Net Ent slots look great and Diamond Dogs is no exception – it sparkles from every doggy pore and woofs accompany you on the soundtrack. Two bonus features mean that this game can keep you interested for longer than the average online slot.